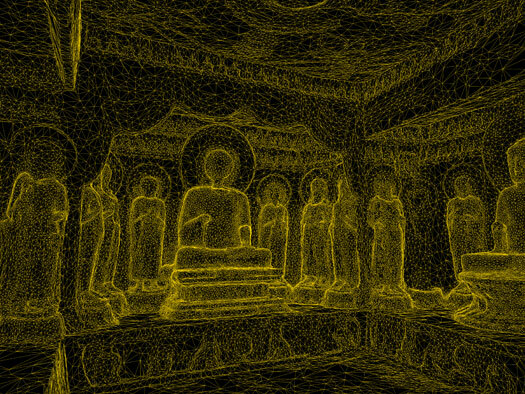 Still from the "digital cave" showing wireframe rendering of the main and side altars of South Cave, Northern Xiangtangshan. Image by Jason Salavon and Travis Saul. Carved into the mountains of northern China, the Buddhist cave temples of Xiangtangshan (響堂山, pronounced “shahng-tahng-shahn”) were the crowning cultural achievement of the sixth-century Northern Qi dynasty. Once home to a magnificent array of sculptures—monumental Buddhas, elaborate attendant figures, and crouching monsters framed by floral motifs—the limestone caves were severely damaged in the first half of the twentieth century when their contents were chiseled away and offered for sale on the international art market. During the past six years, however, the caves have become the focus of a research and reconstruction project based at the Center for the Art of East Asia at the University of Chicago. Combining cutting-edge 3-D imaging technology with old-fashioned scholarly work, an international team of experts has photographed and scanned the dispersed objects as well as the interior of the caves themselves. Organized by the Smart Museum of Art and the Smithsonian Institution's Arthur M. Sackler Gallery, Echoes of the Past represents the culmination of this extraordinary research project. It sheds new light on the original beauty and meaning of the shrines, uniting dispersed objects from Xiangtangshan—considered among the finest achievements of Chinese sculpture—with innovative digital components, including a video installation that provides an immersive, kinetic re-creation of one of the most important caves. In 2004, the University of Chicago’s Center for the Art of East Asia launched a project to identify, locate, research, and document the dispersed stone carvings of the Xiangtangshan caves. Using sophisticated 3-D scanning equipment, the project’s imaging team has photographed and scanned nearly 100 objects believed to be from Xiangtangshan, which are now located in museums and private collections around the globe. Through a collaboration with Peking University and the Fengfeng Office for the Protection and Management of Cultural Properties, the imaging team was also granted official permission to photograph and scan the Xiangtangshan cave sites. A digital archive of the project, cave sites, and dispersed sculptures is available online at xts.uchicago.edu. For each object, the Xiangtangshan research team captured hundreds of overlapping scans that were later knitted together into untextured 3-D models. Through a java application called JScanView, select high-resolution models of the sculptures are available to the general public and scholars worldwide. The 3-D scans captured chisel marks, break areas, and other fine details that allow researchers to match the dispersed fragments to their original locations within the Xiangtangshan caves. With some additional image processing, the objects and shrines can be texture mapped—that is, covered with surface details taken from high-resolution color photographs—to create realistic digital reconstructions of the caves' original appearance. The Smart Museum’s presentation of Echoes of the Past includes thirteen objects from Xiangtangshan and three related Northern Qi works of art. The exhibition juxtaposes dispersed sculptural fragments with a set of media projects including an immersive video installation, a documentary film directed by Judy Hoffman about the present-day environs of the cave sites, and interactive touchscreen labels related to the monumental stone fragments on view. The Xiangtangshan sculptures on view at the Smart Museum are on loan from the Asian Museum of San Francisco, the Cleveland Museum of Art, the Sackler Collections at Columbia University, the Metropolitan Museum of Art, the University of Pennsylvania Museum of Archaeology and Anthropology, the Victoria and Albert Museum, and the Virginia Museum of Fine Arts. A centerpiece of the Echoes of the Past exhibition is the "digital cave," an immersive video installation overseen by artist and University of Chicago faculty member Jason Salavon. Three rear-projection screens show a montage of black-and-white archival images, contemporary color photographs, and 3-D digital reconstructions of the South Cave, Northern Xiangtangshan. This poetic video installation provides visitors with a vivid illustration of the site's modern history, tracing an arc of despoliation, preservation, and reconstruction. The first comprehensive publication in English on the cave temples of Xiangtangshan, the exhibition catalogue includes essays by leading scholars and full color illustrations of the sculptures and caves. Katherine R. Tsiang, Associate Director of the Center for the Art of East Asia, Department of Art History, University of Chicago, in consultation with Richard A. Born, Senior Curator, Smart Museum of Art, University of Chicago and J. Keith Wilson, Associate Director and Curator of Ancient Chinese Art, Freer and Sackler Galleries. Echoes of the Past: The Buddhist Cave Temples of Xiangtangshan is organized by the Smart Museum of Art, University of Chicago and by the Arthur M. Sackler Gallery, Smithsonian Institution. Major funding is provided by the Leon Levy Foundation, the Smart Family Foundation, the E. Rhodes and Leona B. Carpenter Foundation, and the National Endowment for the Humanities. Additional support for the Smart Museum’s presentation is generously provided by the National Endowment for the Arts, the University of Chicago Women’s Board, and Helen Zell. The exhibition catalogue was made possible by Fred Eychaner and Tommy Yang Guo, with additional support from Furthermore: a program of the J. M. Kaplan Fund. Any views, findings, conclusions, or recommendations expressed in this exhibition do not necessarily reflect those of the National Endowment for the Humanities. Presented in the Richard and Mary L. Gray Gallery for Special Exhibitions.